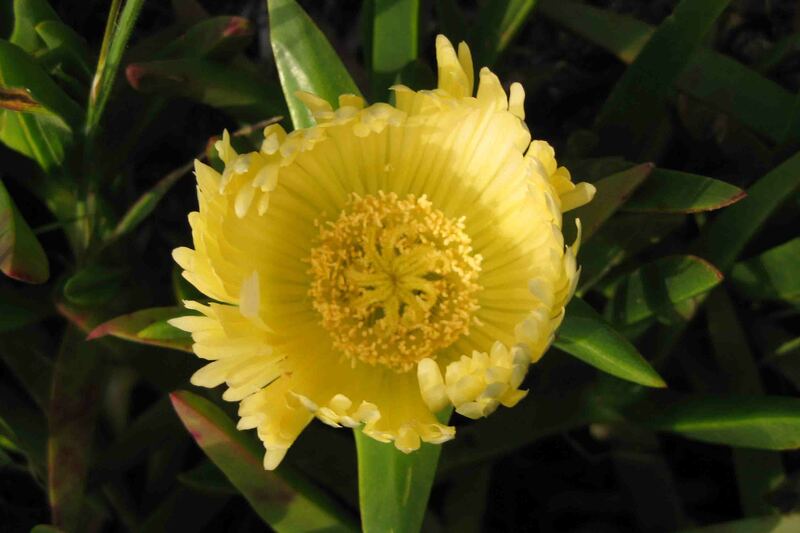 We began our day in Morro Bay State Park. 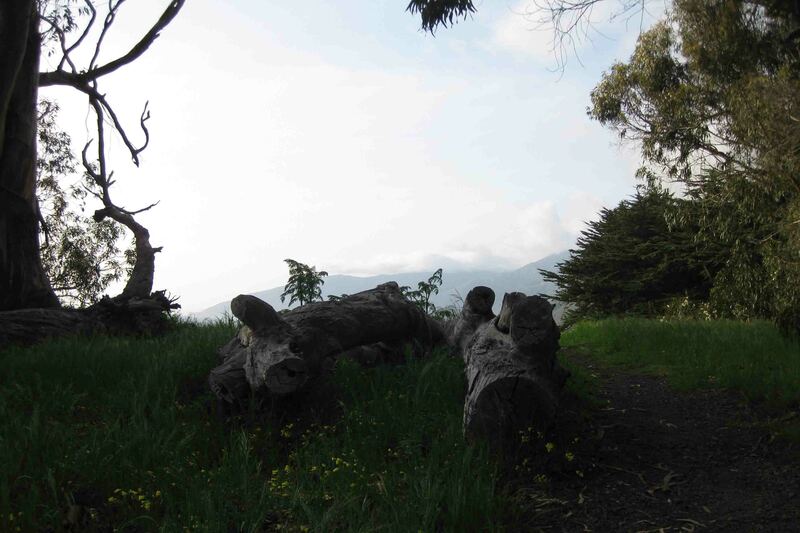 The park includes a golf course, hiking trails, countless geocaches, a marina and café, a natural history museum, and a nesting area for egrets and cormorants. In addition, dogs are allowed on most trails, so Petey and I spent the morning walking along dirt trails, past the marina and golf course and up a few hills in search of geocaches. I wasn’t too successful. I found 3.5 out of 6. The 0.5 comes from finding the first part of a multi-cache. I figured out the coordinates for the second location, but could not find the micro. Oh well, we learned quite a bit about birds’ wing spans and nesting areas while we searched. We basically spent the whole morning there which I didn’t expect, but it was nice just to walk around and enjoy the ocean breeze and the view. Morrow Rock stands at the entrance of the harbor. Twenty million years ago, the rock was buried under sedimentary material. Over time, the material eroded, exposing the monolith seen today. Twenty thousand years ago, the rock stood inland, but as the glaciers melted, water rose to surround the rock. 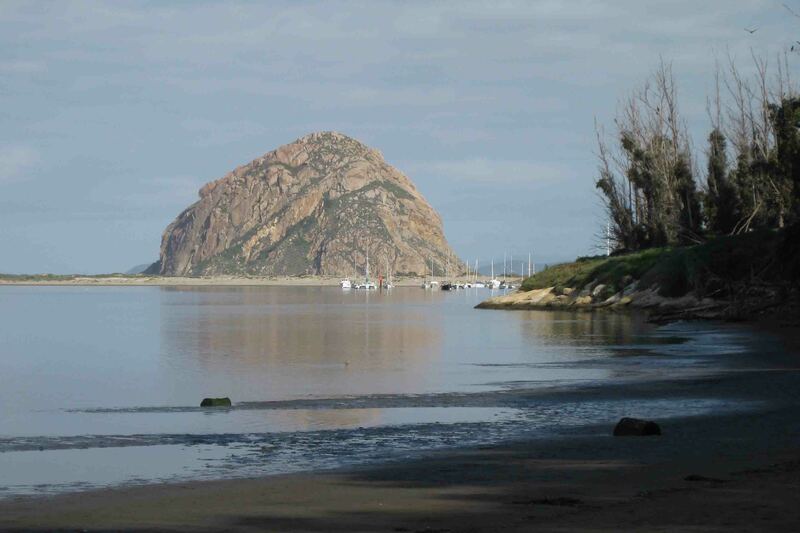 The rock blocked the currents of the sea causing more sand to be deposited than carried away thus shaping the sandy spit that protrudes into the harbor. Today the rock serves as a nesting place for peregrine falcons. 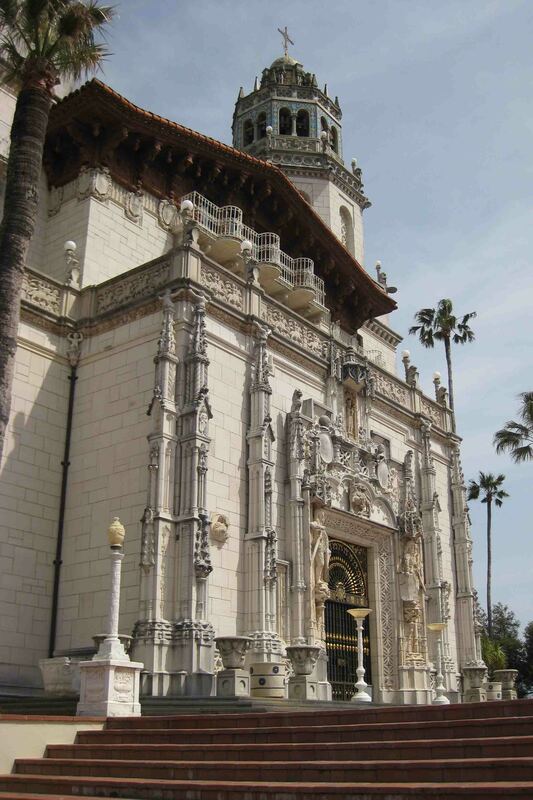 After lunch we headed north to Hearst San Simeon State Historic Monument to tour Hearst Castle. The park offers four different day-time tours and an evening tour, but the number of guides has dropped from 130 to 50, so some of the tours are being discontinued. 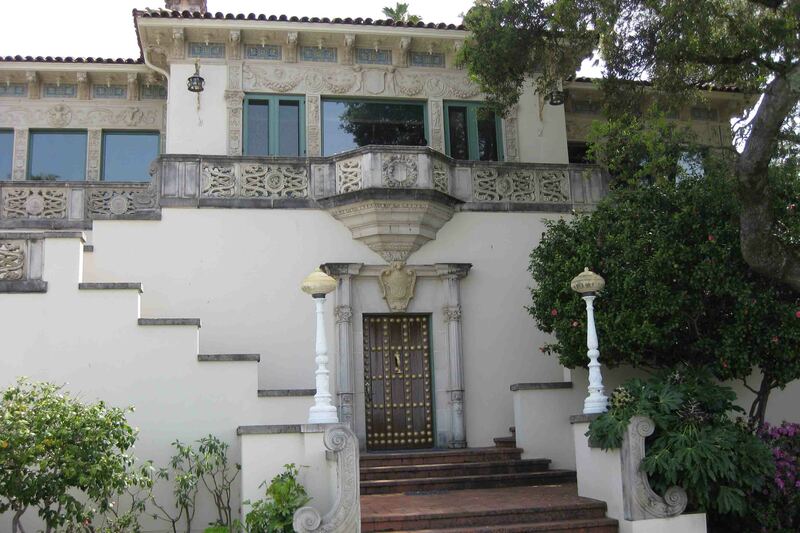 I took tour 2 which led the group past the outdoor pool (the most photographed in the world), through the upstairs rooms including William Hearst’s bedroom, through the kitchen and past the indoor pool. The guide was a wealth of knowledge; however, the state is no longer printing pamphlets about the tours (I’m presuming because the State is broke), so I won’t be able to come close to regurgitating all the interesting facts. What I recollect is as follows: William Hearst was the son of a wealthy miner who earned $1,000 a day many years ago. As a child he vacationed in the area and always loved it. Hearst, a successful publisher that owned 94 different companies, built the castle, which he called a ranch in the 1920’s. If guests were invited to his castle, that would have been to Wales. 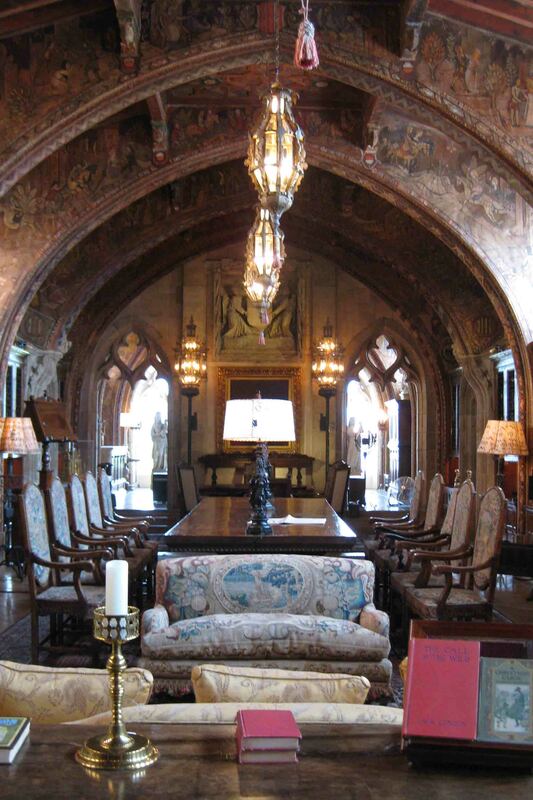 In fact, William Hearst owned 35 homes, and the Hearst Castle was his favorite. He showcased all his favorite art work in this castle which came from Italy, France, China, Egypt…basically all over. His other homes were decorated with themes, but this home was much more eclectic. The castle is built of cement and getting to each room was mazelike. It is said that each ceiling is different so that if his guests were lost, they could call the staff and describe the ceiling in order to get their bearings. 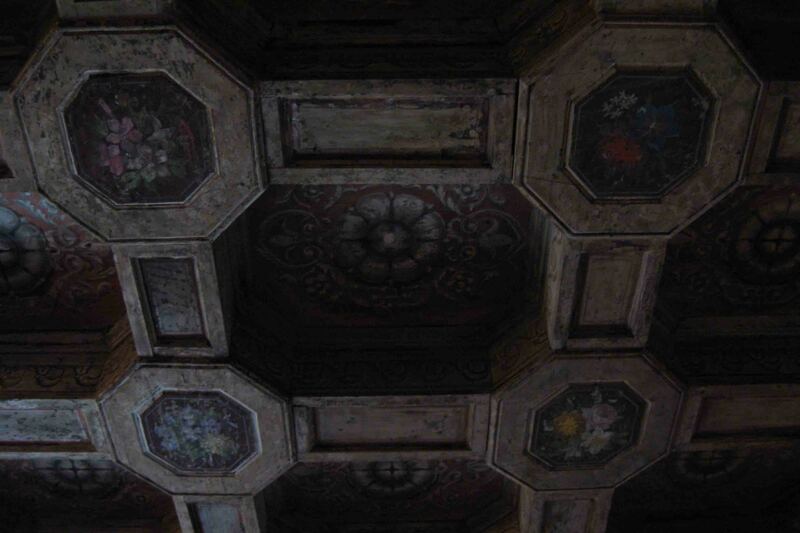 The ceilings are basically carved and painted woodwork that is hung by cable from the cement ceiling higher above. All the woodwork in the home was extremely intricate. The castle, with 38 guest rooms and 42 bathrooms, shares 250,000 acres with three other guest houses, gardens, and a variety of animals, including zebra. At one time, Hearst operated a zoo here. One of the two story, ten room guest houses could fit inside the living room of the castle. In fact, the castle is the largest home in California and the second largest home in the United States behind the Biltmore in North Carolina. Hearst’s bedroom is the simplest of all the rooms in the house…even less extravagant than his guest rooms. His office, on the other hand, was giant. It includes walls of books surrounding a conference table. The ceiling in his office is painted cement. The castle’s kitchen was amazing. 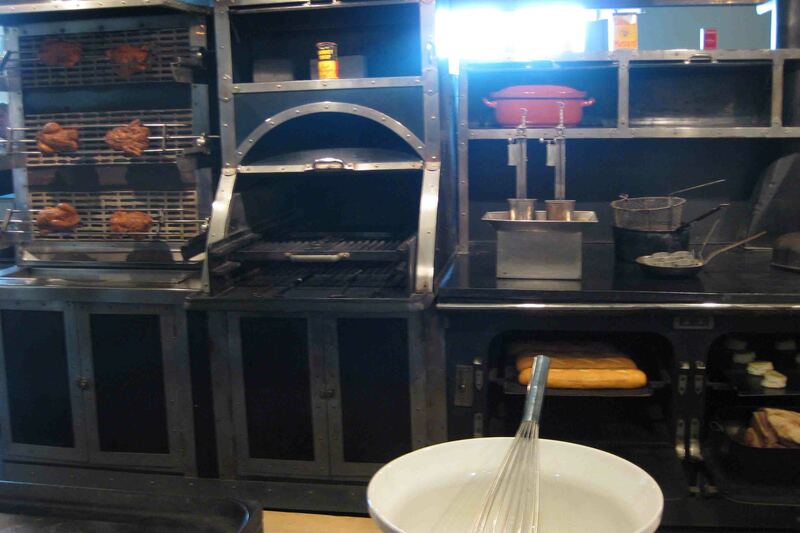 It included an extremely long island, several sinks, a towel dryer, warming drawers, several refrigerators, industrial sized ovens, rotisseries, and a blender that stood probably four feet tall from the ground. It was enormous. A two-keg, beer stand stood right in the middle of the room! The battery to my camera died just in time to miss a shot of the indoor swimming pool. The pool was built below the tennis courts that included clear blocks that functioned as skylights beneath the nets so that light filtered into the pool area. 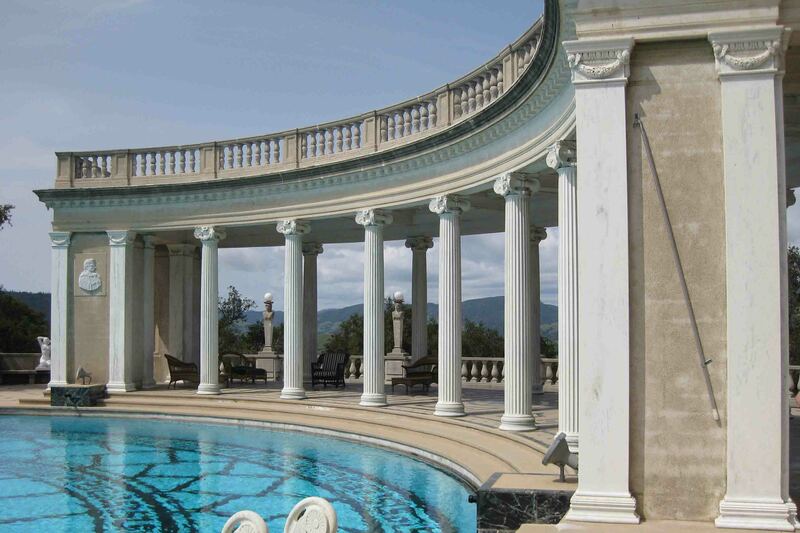 Some of the tile used in the pool is inlayed with 22 karat gold! All the water used at the castle comes from three springs on Pine Mountain and the water system is gravity fed. There are no pumps! I believe there are three water storage containers at the castle. One of them was on a hill that Hearst could see out of his bedroom window, so he had his gardener camouflage the tank with 6,000 trees. In fact, the gardener planted over 70,000 trees while he worked at the castle. Having only gone on one of the five tours offered, I’m certain I am leaving out all sorts of information, but it was time for Petey and me to continue north. We pulled off in a few turnouts to enjoy some fantastic views. 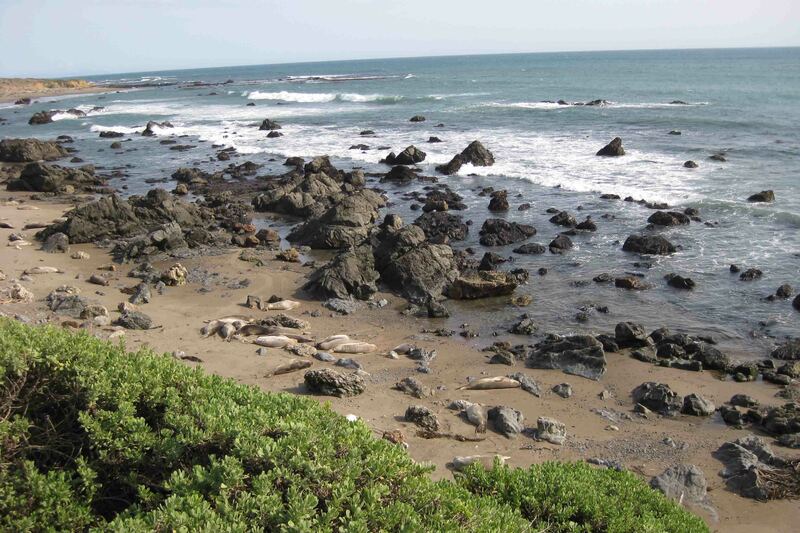 We even found some seals sunning on the beach below before we continued north. We arrived at Plaskett Creek Campground in Los Padres National Forest around 5 pm. What a lovely campground…tree covered, asphalt sites with tall green grass growing around them. We took a walk around the campground, crossed Highway 1, and spent some time enjoying Sand Dollar Beach. 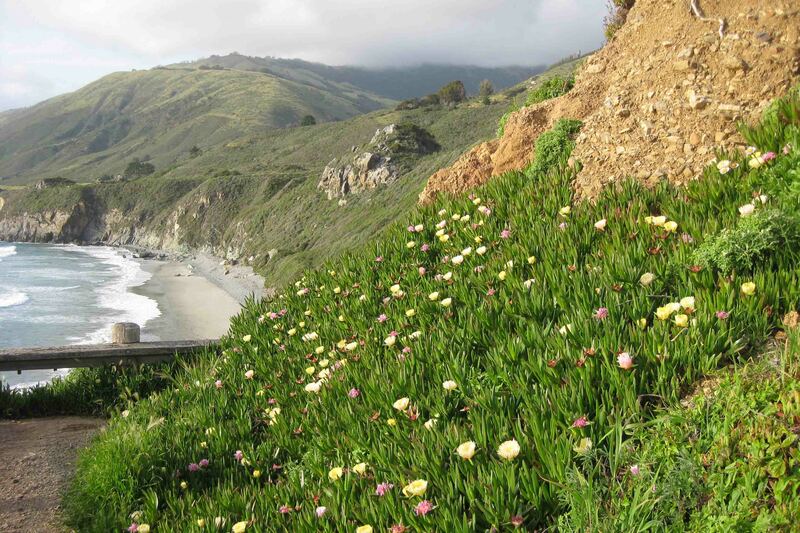 We descended the wooden stairs built above the creek while snapping photos of the wildflower covered hills and the pebble beach below. While we didn’t find any sand dollars on the beach, we found remarkable amounts of jade. We piddle around waiting for the sun to set, but it seems on the coast its sets much later than it did in the mountains, so we strolled back to visit VANilla. Hearst Castle is amazing! I loved seeing it through your photos! The fret work on the front of the castle is beautiful, as is the ceiling in your photo! I love the enamel ware beer kegs! Very cool. What a treat to see something so old and beautiful. I would have enjoyed going through it with you. I think I will have to check it out on the way home I think. The slide blocked part of Hwy 1 and it didn’t work out for me to go there right now. 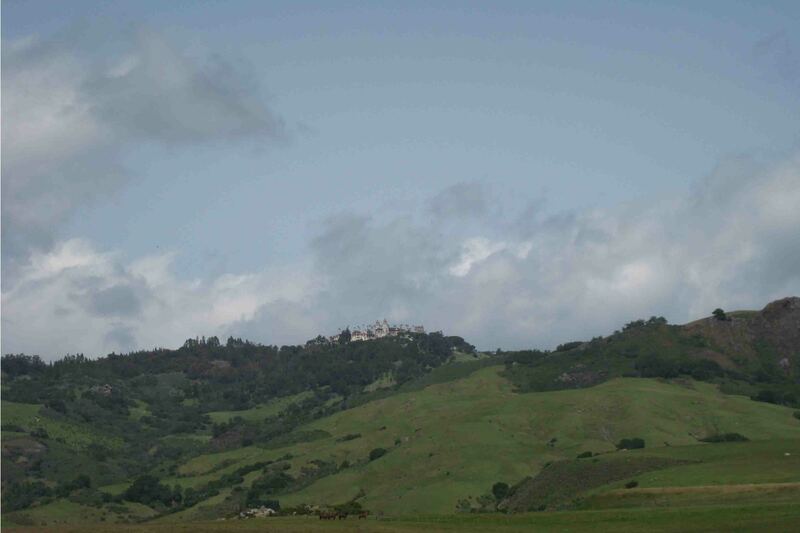 Hearst Castle had a hunting preserve north of the castle. It was sold to the governement and is used for Army training and testing. It is called Ft. Hunter Liggitt and is about 160,000 acres of very beutiful land. 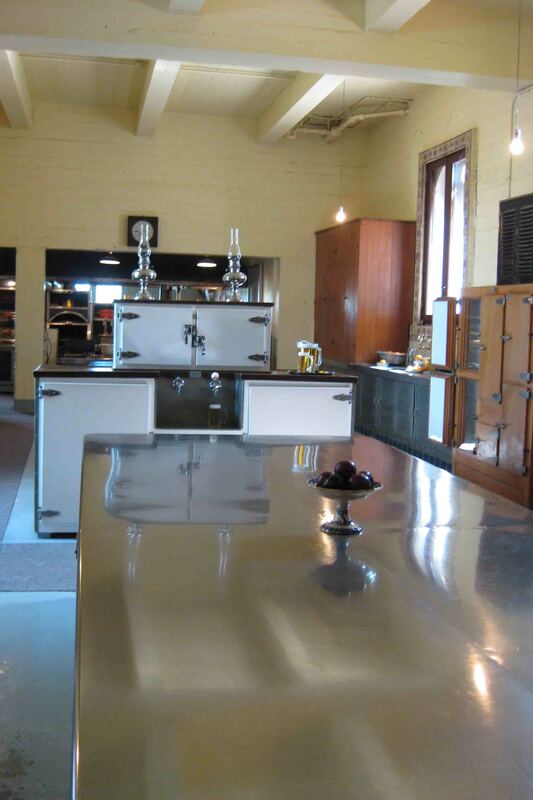 Hurst’s architect built a “bunk house” there called the Hacienda. It is a beutiful Spanish style build that was the VIP housing and dinner hall. I ate many meals there in the 90’s when I was there doing testing for the Army. Hurst had the property stocked with european deer and wild boar (in the days before they had was against that type of thing). The irony was that Hurst was the antithesis of an outdoorsman and did not frequent the site. You can enter the base on the east side (near a town called Jolon) and drive west though the base. 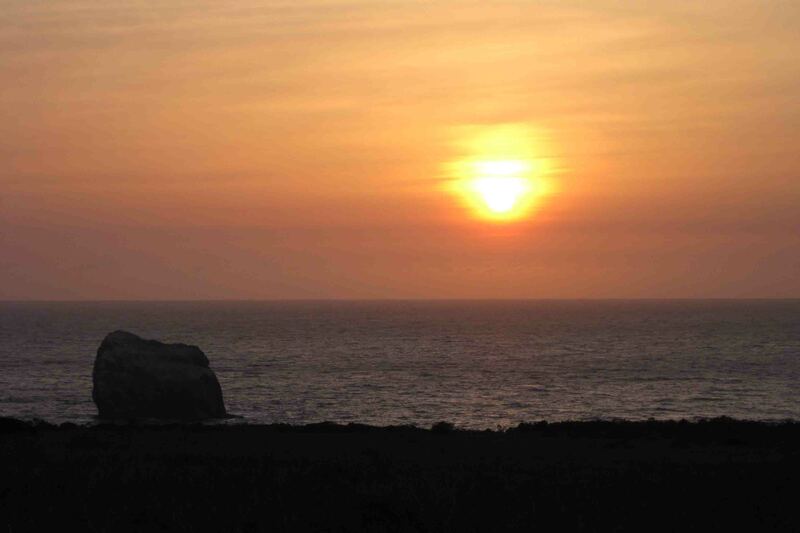 The western exit is the edge of Limekiln National Park. If you continue through that Park you get back on US1. It is a great drive but you have to call aheadn and see if the road is open to the public since the base is often time closed to vistiors. Are you going to Yosemite? Another recommendation!